HVAC analysis for the international airport was executed to evaluate the air flow and temperature uniformity inside the building. 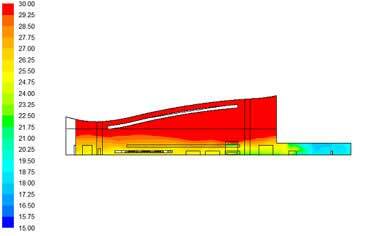 Heat loads of shops, offices and people were taken into consideration to identify the mass flow rate and temperature requirements for effective thermal comfort inside the building. Effects of doors, windows and glass roof were also taken into consideration, in order to comprehensively evaluate the efficiency of the HVAC system for the building. Evaluating the effectiveness of the HVAC system design for a building is often one of the complex tasks for engineers. Suitable placement of supply air outlets, degree of freshness of air inside the building, heat loads within the building and ventilation availability are some of the required parameters to determine the comfort conditions suitable for humans. A leading infrastructure enterprise from India partnered with Hi-Tech to measure the performance of their HVAC system designed for the international airport through Computational Fluid Dynamics. The drawings provided by the client were converted into 3D CFD model including the equipments, shops & offices within the building. 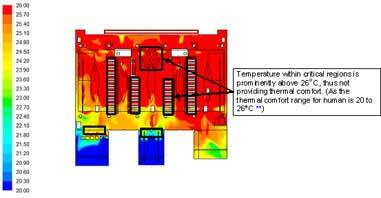 Heat loads for the same were determined to replicate real thermal conditions including the long people queue situations. The effects of glass roof, doors & windows were also taken into account to measure the addition of heat inside the building. 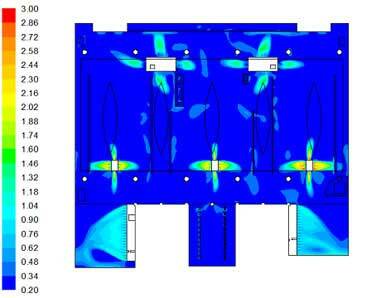 Boundary conditions for the inlet and outlet air flow were applied along with suitable turbulence model to calculate velocity and temperature distribution inside the building. Critical regions with higher air velocity (above 0.2m/s) and temperature (above 260C) were identified through post-processing to measure the efficiency of the supply air outlets (Binnacles). The results suggested a need of changing the placements of binnacles and also reducing the supply air temperature to maintain sufficient thermal comfort within the building.